Corinne discovered her love for teaching early in life. By the age of 14 she had 8 private students, and she has made her living as a piano teacher ever since! In addition to private lessons, Corinne has taught music theory, composition, music appreciation, preschool music classes, choir, summer workshops, and group piano classes for beginners. 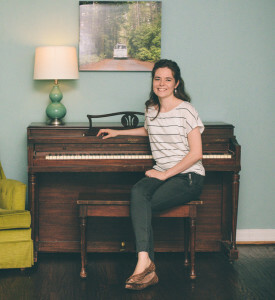 Corinne specializes in turning reluctant students into enthusiastic pianists, and fanning the flame for students who are already “hooked” on piano lessons. Over the years, her student roster has included those with ADHD, gifted and talented students, individuals on the autism spectrum, preschoolers, and adults from college students to retirees. Corinne holds a liberal arts degree in music from Texas Woman’s University, where she studied piano with Dr. Richard Shuster. She is an active member of Carrollton Music Teachers Association, and has served on their board of directors as secretary (2013-2015) president elect (2015-2017) and president (2017-present). In her free time, Corinne enjoys drinking good coffee, trying new recipes, and visiting with friends and family. (Okay, and Netflix. Lots of Netflix.) She loves to play Classical repertoire at the piano, but her listening playlists are more likely to feature Elluvium, the Beatles, Blind Pilot, Head and the Heart, or Indelible Grace. Corinne lives in Denton, Texas with her husband Paul and their children Louise and Rigby.